Leah Hogsten | The Salt Lake Tribune American Fork High School football star Chase Roberts has committed to play for Brigham Young University, July 22, 2018. Leah Hogsten | The Salt Lake Tribune American Fork High School football star Chase Roberts has committed to play for Brigham Young University, July 22, 2018. Leah Hogsten | The Salt Lake Tribune American Fork High School football star Chase Roberts has committed to play for Brigham Young University, July 22, 2018. Leah Hogsten | The Salt Lake Tribune American Fork High School football star Chase Roberts has committed to play for Brigham Young University, July 22, 2018. Leah Hogsten | The Salt Lake Tribune American Fork High School football star Chase Roberts has committed to play for Brigham Young University, July 22, 2018. Leah Hogsten | The Salt Lake Tribune American Fork High School football star Chase Roberts has committed to play for Brigham Young University, July 22, 2018. 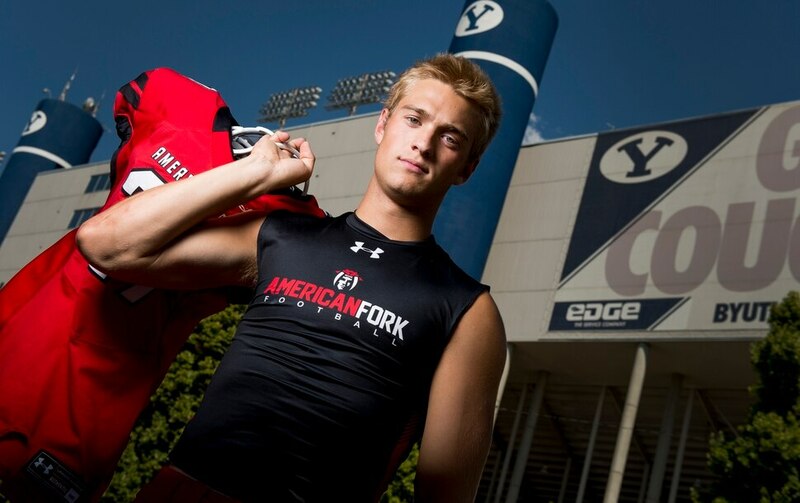 American Fork • Chase Roberts didn’t cause much of a stir when he committed to play football for BYU in June of 2017, partly because he had only completed his sophomore year at American Fork High as a standout basketball and football player. But the lack of hype could also be attributed to familiarity. Roberts appeared to be one of those local products with no other offers that BYU always seems to get. Roberts is “blowing up” in national recruiting circles after the numbers he posted at a talent combine in Ohio. Roberts’ SPARQ (Speed, Power, Agility, Reaction and Quickness score to determine agility) score at The Opening, which drew some of the top recruits in the Midwest, was 120.0 and ranked third behind only Iowa receiver Jace Andregg and Illinois running back Anthony Williams. Roberts, a 6-foot-3, 200-pound receiver, received offers from Utah and USC (since rescinded when Roberts told the Trojans about his mission plans) this summer and more are almost certainly on the way, according to American Fork coach Aaron Behm. Having caught 68 passes for 1,200 yards and 15 touchdowns his junior season, Roberts has already broken many of the school’s receiving records heading into his senior year. That’s saying something, considering American Fork has produced standouts such as former BYU receivers Toby Christensen, Ryan Slater and Jonah Trinnaman and former Utah receivers Derrek Richards and Jake Murphy. In the past few years, BYU has received early commitments from players with Roberts’ talent, only to lose them to Pac-12 schools when signing day arrives. Jeff Hansen of the BYU-based website on the 247sports.com network said holding on to Roberts will be critical for the Cougars. Roberts was adamant in July that it won’t happen, citing his ties to the school and the fact that his father, Kyle, was a defensive back for the Cougars when Ty Detmer played there. Roberts said the first coach to offer him a scholarship was actually new BYU receivers coach Fesi Sitake when Sitake was the offensive coordinator at Weber State. “I already had a good relationship with Fesi, so I was really happy when BYU hired him,” Roberts said. 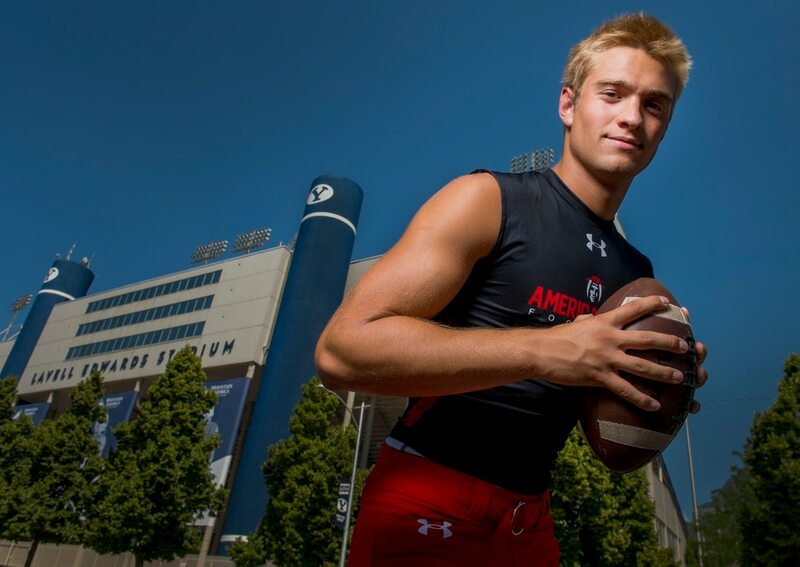 In mid-June, a Utah-based team featuring Roberts won the 7-on-7 passing competition at USC’s camp. Roberts also used to play baseball and was skilled at that sport, too, but had to drop it because it conflicted too much with his football development. He expects the Cavemen to challenge for a region championship this season.